If you need assistance in governing your IT operations then come talk to us. The best way to describe our portfolio is “IT management as a service”. 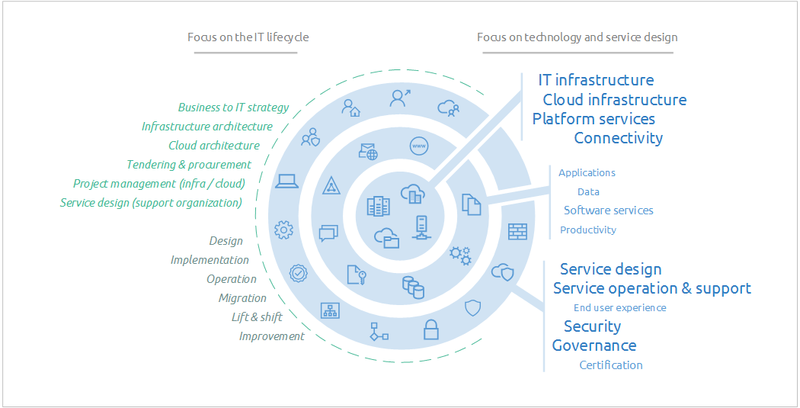 We’ll help you define, implement, manage and improve your Hybrid IT infrastructure while translating tech talk into business insights and vice versa. Bridging business and technology is crucial in getting everything aligned, agile, flexible and (cost) efficient. Looking for guidance regarding your datacenters and infrastructure management? Want to look into the possibilities offered by public or private cloud providers? Struggling to connect locations, users and an explosion of decentralized solutions locally or globally? Click through to discover how our experts can help you assess, define, build, evaluate and iterate. Managing your solutions is more than just hiring some technical staff and paying license fees. Click through to discover how our experts start where the whitepapers ends. Business continuity, risk control and security are critical to your business operations. Click through to learn how to arm yourself in a globalized and increasingly faster paced world, more aggressive and hostile than ever before.